Fall has finally arrived and with it comes cooler winds and a change in the season's colors. The leaves of the trees have turned a golden brown and the sun shines quite a different way, doesn't it? In Fairy Land, Fall is celebrated with pumpkins and lots of preparation for Halloween. Let's see what we have in store for Fall-themed fairy garden goodies, which you can add to your own garden this magical season! What a sight! 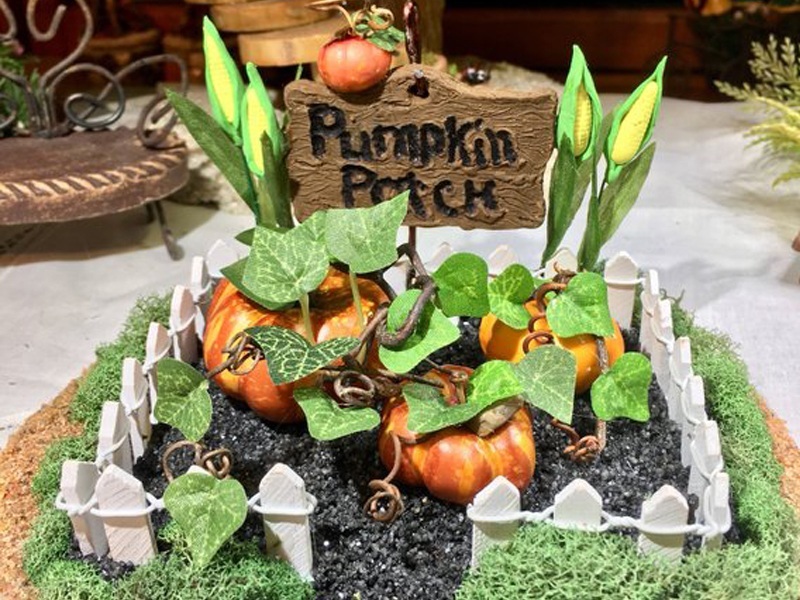 This pumpkin cottage fairy house would be a bright centerpiece for any Fall-themed fairy garden. Its pumpkin shape gives off an energetic feeling that Halloween is just around the corner. It also features some potted vines crawling on the exterior wall of the house, a crooked grey brick chimney, a grey rock foundation, and super cute windows with shutters. Always make sure to add a fairy garden gate to keep all the trolls away! This Fall-themed gate features seasonal flowers and bright new pumpkins alongside the gorgeous stone wall and metal gate. Add a touch of Fall whimsy to your fairy garden with this rustic wheelbarrow made of metal and three gorgeous gourds! These gourds are freshly harvested by the hardworking fairies, straight from the pumpkin patch! The Fall season calls for a change in fairy furniture! This orange metal chair is perfectly paired with a pumpkin-themed throw pillow that's super comfortable to lean on. Let your fairy friends enjoy some lemonade while lounging on this very chic piece of garden furniture. This season, let your fairy friends indulge in delectable sweet pumpkin treats, tea, and pumpkin spice lattes. This delightful set features a unique black and white tea set and some sweets, with a spider web table runner. Totally creepy! When Fall arrives, you know that Halloween is just around the corner. Await the exciting holiday with these charming fairy garden Halloween accessories featuring a number of items to collect! There is the orange wooden Adirondack chair and throw pillow with ghosts and pumpkins, a metal “Happy Harvest” sign on a stand, a small bale of hay, a Witches Broom sign, orange Halloween sign, and of course, a Jack O Lantern! For a totally spooky Halloween fairy party, go for these rustic little accessories that bring charm to your fairy garden. You can choose from a metal Trick or Treat sign, glow-in-the-dark bats, small and large Jack-o-Lanterns, witches legs, candy corn picks, and a lantern with super cute ghosts and webs. Such a fine collection of items for a Halloween enthusiast! Make sure darkness never befalls your fairy garden with these tiny candlesticks that fits the season perfectly! Each candlestick comes with a different Fall design. The orange colored candlestick is an autumn/Thanksgiving-themed one, while the black and white ones are more appropriate for Halloween. Stick this into a fresh patch of groundcover for a spooky touch to your Halloween-themed fairy garden! These headstones are easy to install, as it has picks already attached to it. You can even attach them at an angle for a weirder look and creepy feel! As a finishing touch, add this spooky Halloween tree near the gravestones to keep your fairy friends on their toes! This tree, from which hangs pumpkins, ghosts, bats, and skeletons, will add a creepy but totally fun feel to your Halloween fairy garden. Have fun collecting Halloween- and Fall-themed fairy garden goodies with these and more fun accessories that you'll find in the link below. To make sure you're updated on all things fairy garden, bookmark Teelie's Fairy Garden.